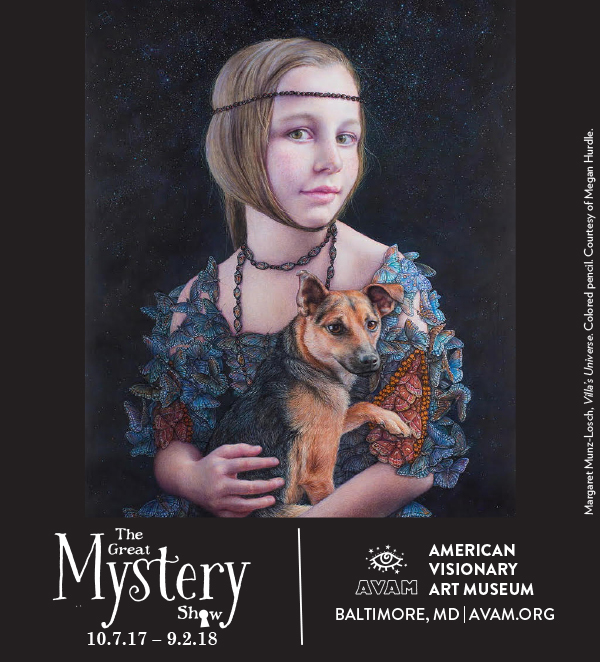 The American Visionary Art Museum's current mega-exhibition, The Great Mystery Show, is in its final month and closes forever on its final day Sunday, September 2 at 6pm. The wildly popular, critically-acclaimed Great Mystery Show has drawn crowds of repeat visitors to explore mystery as that one secret power behind great art, science, and pursuit of the sacred. A "must-see" exclaims Food & Wine about this grand-scale visual exaltation of mystery as the strangeness and wonder behind Life itself. Visitors are treated to 3-D glasses to experience the full intensity of ayahuasca-inspired paintings, and then invited to enter the world of Voudou figure Legba and other deities, intricately beaded from floor-to-ceiling by Nancy Josephson. The Great Mystery Show offers an up-close peek at the genius of mystery master, Edward Gorey's Gashleycrumb Tinies drawings through the rarely-granted permission of the Edward Gorey Charitable Trust. Never-before exhibited artists like Peter Eglington and Aric Wanveer are among "the featured makers in AVAM’s show [that] span many backgrounds, from scientists and astronauts to mystics and philosophers," says Baltimore Fishbowl in describing this one part fun house, two parts cosmic dream lab focusing on Mystery as it holds the door open to our human imagination and fascination with whodunit film and books, and theological and scientific inquiry. About the American Visionary Art Museum (AVAM) is a Congressionally-designated national museum and education center dedicated to intuitive, self-taught artistry. It champions the role intuition plays in creative invention and innovation of all sort — be it art, science, engineering, humor or philosophy, and especially in compassionate acts of social justice. SPEND LABOR DAY WITH AN DIE MUSIK LIVE! Spotlighters presents CONSENT, a new play! BALTIMORE ROCK OPERA SOCIETY IS HIRING!